As I’ve mentioned before, I resist the western art historical tendency to consider the art of ancient Greece and Rome as the high points of artistic achievement, in a broad view of art around the planet. Don’t get me wrong, Greece and Rome were marvelous civilizations with impressive artistic achievements, the influence of which still affects aesthetics in the West. However, when looking at art from ancient Greece and Rome, I tend to focus on the miscellaneous arts. As we saw in my posting on May 26, the miscellaneous arts from classical antiquity are truly awe inspiring and fascinating, especially since so much aesthetic effort went into pieces meant for daily use. Such, I feel, is the case with ancient Greek ceramics. Many people believe that these beautifully decorated, elegantly shaped vessels were meant merely as decoration, but, the majority of the shapes were meant for everyday use around the house. Ceramic arts in Greece and the Greek Islands date back to the Neolithic period, in coil- and slab-built forms. The potter’s wheel was introduced during the 18th century BCE from the ancient Near East. From the 9th to 8th centuries BCE the majority of Greek ceramic shapes evolved into forms that endured into the first millennium CE. In Attica, the two main ceramic centers were Corinth and Athens. 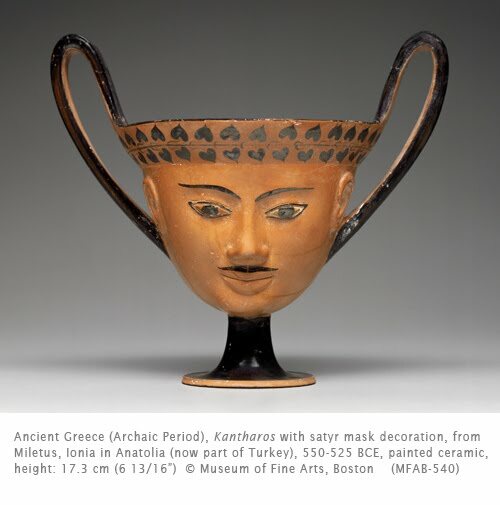 By 550 BCE Athens was the chief ceramic center of the Mediterranean, exporting wares to northern Africa, Asia Minor, Sicily, Italy, and even as far as France, Spain, and the Crimea. All ceramic shapes were made for actual use, and their form corresponded to their function. The kantharos was a drinking vessel. It was associated with Dionysos, the god of wine and grape cultivation (referred to as Bacchus in Roman mythology). Dionysos supposedly always carried around a kantharos and it was never empty. The association with Dionysos makes the decoration of this kantharos very relevant: the exuberant satyrs were constant companions of Dionysos. The use of satyr decoration on these drinking vessels was particularly popular in the Greek colonies in Anatolia, one of the distant lands Dionysos was thought to have visited when he was a young adult. The high, looping handles of the cup – a traditional feature of the kantharos – form the pointed ears associated with the satyr’s physical make up. Technically this cup is painted in one of the two chief styles: black-figure. This is the technique of depicting a figure (or face in this case) in black on the red ground of the vessel. The other style, red-figure, depicted figures in red on a painted black background. Despite the somewhat creepy features of the satyr, the form is elegant and symmetrical, especially in the graceful, looping handles. The British Museum in London has many examples of Greek ceramics. I simply adore the style of ancient Greece, the architecture and the culture, everything was just so great, it really had a great and amazing style and grace. Thank you very much for this post and moreover for the photo, it was great to read this information.